Exchange held global copper inventories have declined modestly as a potential indication of improved global demand. In particular the focus has been on a substantial decrease in copper inventories at the London Metal Exchange (LME). Reuters: Copper inventories in London Metal Exchange warehouses have dropped to a 13-month low, and more declines are seen likely as a pick-up in U.S. demand and concerns about a market deficit outweigh a slowdown in buying from top consumer China. But the LME inventory numbers are not telling us the full story. The Shanghai Futures Exchange (SHFE) has become a major player in the global metals markets. As the LME inventories declined, the SHFE inventories increased, keeping the overall global inventory fairly steady in the last few months (a modest decline from the November levels.) 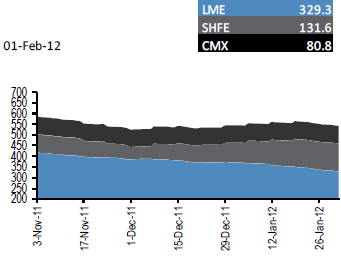 COMEX (CMX) inventories stayed relatively constant. These days relying on the LME inventory numbers alone as demand indicators is no longer sufficient.